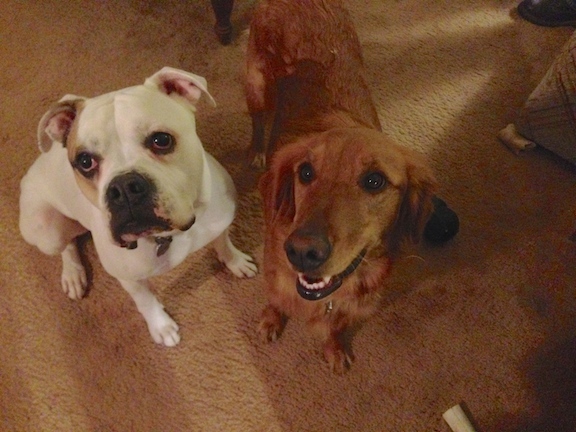 Gazza is a three year old American Bulldog male, pictured here on the left with his room mate Raya a female Golden Retriever. I was called in for help with Gazza’s reaction to the families other dog, a female Pomeranian. When I arrived for the session, Gazza was barking in disagreement at my arrival. One of his owners was holding him back. This restraint was actually intensifying Gazza’s reaction so I asked his owner to let him go. Once free Gazza continued to bark, but the intensity dropped a bit as did a little urine. He was giving me direct eye contact and his hackles were up, but he was also a little hesitant in his delivery. Gazza’s owner repeatedly attempted to disagree and correct him, but he ignored his owner and continued to bark. I stood there facing him holding my ground but Gazza didnt stop, but he did tinkle a bit more. Any time a dog is so excited it looses control of its facilities that way, I know we need to help the dog learn to calm down and relax. I had his owner put Gazza on a leash and hand it to me. Once the leash was on, Gazza’s barking slowed a bit but did not stop. I pulled the leash firmly, but not aggressively, until he was on my left. Once he was next to me, his barking stopped completely. He was pulling on the leash, so I stepped on it about two feet from his head. After a minute of pulling Gazza sat down, but only for a minute. I ignored him and continued a conversation with his owners about what they wanted to get out of the session. It took about seven minutes of sitting, then getting up and again then repeating the process, but eventually Gazza laid down next to me and for the first time went to a calm state of mind. As soon as I could see he was totally relaxed, I took my foot off the leash. He laid there completely calm for the next 10 minutes as I discussed the situation with his owners. By putting Gazza in this time out each time he starts to get over excited, his owner can help him understand that over excitement past a certain point results in a loss of freedom. Adding a consequence like the time out is a great way to communicate boundaries and limits, but it will only work with a dog in a balanced state of mind. Gazza is clearly excitable and part of that is due to his high energy level. Draining unspent energy in a constructive way like a structured walk will go a long way to helping him restrain and control himself inside the home. Exercise plus discipline is always a great strategy to use with you have a high energy dog. We went out for a short walk so I could evaluate the dog and his owner. Because his owner mentioned that he was prone to pull on the leash, I fitted him up with a Martingale collar and added my special twist. I had his owner go first so I could see them exit the home. As soon as they got to the door, Gazza’s energy level had gone back up. He was pulling on the leash and paying little attention to his owner. We stopped and put Gazza into a sit and waited a minute for him to settle down. If a dog is excited before you leave, its going to bring that same excited state to the walk. Stopping, asking the dog to sit and only continuing when its calm, can help Gazza learn that the only way to move forward is by being calm. I demonstrated how to hold the leash and apply corrections when the dog got out of position then handed the leash to his owner. At first Gazza attempted to pull in his own direction, but his owner disagreed and communicated she wanted him to walk at a heel on her right side. It only took a few small tugs on the leash before Gazza was walking next to her at a heel. As we walked I showed her when to get his attention or disagree with him any time he started to get off the mark. By getting Gazza’s attention before he started to get excited, his owner will be able to redirect him into a sitting position or redirect his attention away from reacting to other dogs. I showed his owners a few new forms of communication and some exercises to help Gazza start to respect and defer to their leadership. To rehabilitate Gazza, his owners will need to consistently stop and pause whenever he starts to get over exited or stimulated. By recognizing his triggers and early signs of excitement, his owners will be able to put Gazza into a calming position or redirect his attention before he gets worked up.